Living as I do by Lake Michigan, I have access to one of the world’s largest freshwater systems, the Great Lakes. There are also numerous ponds, lakes and rivers, many of which have established names and are natural to the area (meaning they weren’t built as reservoirs or water-retention sites for the suburbs). I live in a relatively very wet area. Recently I had the opportunity to visit St. Louis for a few days and got to visit the Mississippi River, and that’s when the differences between the rivers really struck me. Sure, they’re obviously different through their ecosystems, sizes, and locations, but there was something else about them as well. Like with people, one person can give off a different impression than another person, even if they look the same. For starters, the Mississippi really did feel like an old man, tired and worn; it was a bit depressing to see it actually, because I felt bad for it. This is going to be a bit more personal of a post, and not entirely focused on Central Europe, as the title suggests. I’ve been interested in bodies of water lately because of how central they are to my region, and through that the folkloric and cultural depictions of them. Lately I’ve been wanting to do more to acknowledge them, outside of an ecological perspective; I wanted to understand them as beings, or understand the beings within them. As far as local perspectives go, the best I can do is what the Great Lakes tribes have said (and made publicly available to non-Natives); particularly the Ho-chunk and the Potawatomi, since they were the most recent Native inhabitants of this area. Non-native perspectives tend to be that of the scientific persuasion, where water is simply a non-living resource that’s essential to life. Or the business persuasion, which ranges from tool to travelway to dumping place for waste. As you can probably tell, I don’t care much for the latter, and the former, while is useful for research purposes, is limited in scope. I have yet to find anything that suggests the immigrant populations developed their own perspectives on the local rivers; it is possible that some applied their “Old world” views initially, which I will touch upon later. First off, the Ho-chunk “Waterspirits”, named Wakčéxi in the source I’m using (I’m not even going to try to pronounce that). “Water Panther” from Wikipedia. You can see the characteristic long tail and horns/antlers described in recordings from Great Lakes and Midwestern tribes. They seem to be beings that are mostly made OF water that living in rivers and other water-based dwellings. Their bodies are serpentine, although in other sources they are allegedly described as “water-panthers” by an old observation of a Potawatomi ritual. The cat-like and snake-like personifications make sense to me when taking into account how water moves as it flows. Both animal types and water have that “slinky” or curving look about them, yet can also lash out unexpectedly. These are beings that are unique to whatever river/lake system they live in, have different “ranks” or roles indicated by their colors, and can be neutral, harmful or benevolent to humans, depending on a variety of factors. It seems that they particularly like tobacco and the color red, if the stories are any indication. A different interpretation of the “water panther”, with the artist giving it more catlike features. Obtained from Cryptomundo.com. Compare to different “species” of water spirits, the rusalki/rusalka, vodnik, hastrman, and the nix. From Russian, and Central European folklore, these are often depicted in humanoid form in modern times, but through their descriptions they have a variety of forms (as varied as their names, many of which were not listed) and may be able to shapeshift from one to another. In some tales they are actually human in origin, such as being the souls of girls who committed suicide through drowning (rusalka). They have been compared to mermaids and sirens of Greek mythology and modern folklore, for reasons of both personality and location (water sources). It has been said that millers and fishermen are usually in league with these “devils” (in modern folklore) because they are the people who’s profession forces them by or in water constantly. Naturally then they would be making offerings in order to go about their jobs without problems. However, sometimes the stories get a little crazy and end up suggesting that humans are drowned by millers and fishermen in order to make a sufficient offering for the water spirits. The image of the water spirits is not limited to the humanoid, however. 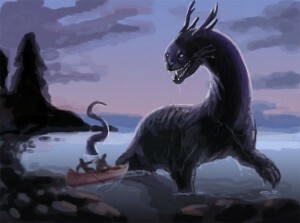 European cultures have also associated mythological snakes and snake-like beasts (such as the Hungarian zomok) with swamps and rivers, making them water-spirits as well. That is not to say that all depictions of water spirits are malevolent. Indeed, they can be quite helpful to humans, as depicted in the High German saga, the Nibelungenlied, with the Rhine river and Danube river water maidens. Numerous folktales also reveal a beneficial side to the water spirits, so long as the humans are respectful in return. That’s pretty much the lesson behind most folktales involving other beings, you leave them alone or hold up your end of the bargain, and you’ll survive just fine. Interestingly enough, in Polish and some other Slavic countries people will tie offerings on the trees to appease the water spirits, or give garlands and food, which is similar to how humans interact with the Ho-chunk water spirits. So what does this mean? This means that the view of water-spirits on both sides of the pond seems to be that there are beings living IN the water, much like the fish or plants. It seems less like the river itself is alive, however that could be a European influence rather than something inherent to the Great Lakes tribes. There is also agreement that these beings can be interacted with in certain situations, and those interactions can be good or bad for a human. As far as personal experiences go, I don’t go into the lakes and rivers around here, so I haven’t interacted as much as I would like. The heavy human presence due to urbanization also seems to “tame” the rivers, although not as much as the southern parts of the Mississippii. In Poland, Russia, and Slavicized areas of Central Europe they tend to have celebrations connected to rivers and lakes (and therefore the water-spirits) sometime in the Summer or late Spring (in parts of Russia it’s called “Rusalka Week” or Semik”, early June). The time of year when everything is most active, and it makes sense that the water-spirits would also be active at this point. I can imagine them hibernating or going into torpor in the winter like other beings. 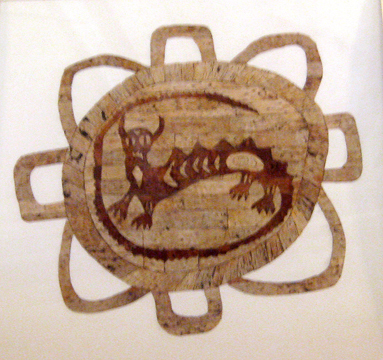 The Ho-chunk waterspirits apparently had festivals in their honor, but I have yet to find when that occurred. 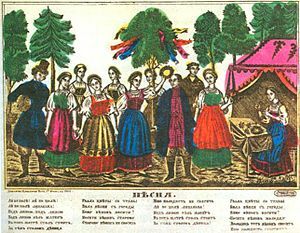 An old illustration depicting the ribbons and garlands strung on the tree during Rusalka Week/Semik to appease the water spirits. Obtained from wikipedia. For me, Summer is the time I interact with the water the most, as I am out in the preserves for work and there is no ice to block the water from me. That would be the time that I give offerings then, primarily food such as hard-boiled eggs (I didn’t realize that was something given to the Rusalki until reading the book linked below, I just guessed). I have never bought tobacco before, so I plan on doing a bit more research to obtain some good stuff before using that as an offering. However, food works in the meantime. Ooh, thank you for this! I’ll shall dig into that this weekend. Yes, your practice is mentioned in the book I referenced as well (I think the google excerpt may actually show that chapter? ), and it also reminds me of the Morena/Marzanna/Etc. rituals where the witch of winter depicted by a doll is drowned away in a river. Found throughout many of the Slavic countries. Yes, when I was first interested in Slavic mythology, Marzanna was one of my favorites. I also perform yet another Slavic effigy-destruction ritual, Yarilo’s Funeral, every year. Simple symbolism but powerful stuff. I find simple to be best for many things as well.